In all walks of life we know people who perform better at different times of the day and whether it is at work, school or even at home we can easily think of many examples of people who are either early risers or night owls. It is no different when it comes to sport as there are many athletes who may be at their best in the early morning, and others in the afternoon or evening, but the difficulty is that they generally don’t decide at what time they perform in the big events. As a result, the individual body clock is another factor that athletes and coaches need to take into consideration when following their training program with a view to achieving peak performance. 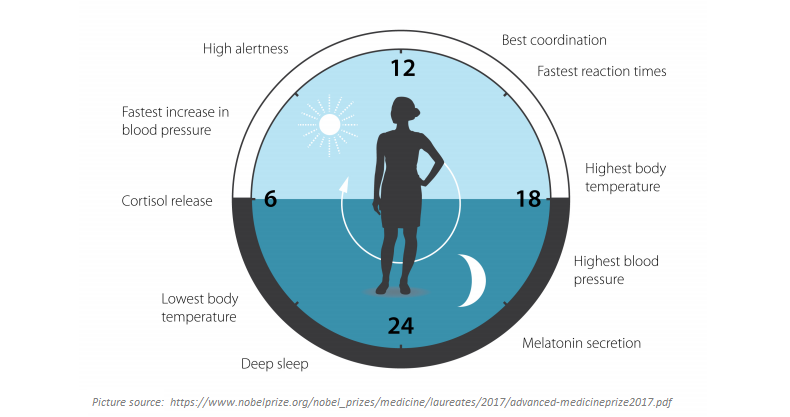 This topic has hit the headlines in recent weeks following the awarding of a Nobel Prize to researchers who uncovered the molecular mechanisms controlling circadian rhythm, or what we refer to as our internal biological clock. While this research may be very detailed there are many studies that illustrate the importance of understanding an athletes body clock. Among them is a study carried out by Roland Brandstaetter and Elise Facer-Childs at the University of Birmingham in the UK, entitled The Impact of Circadian Phenotype and Time since Awakening on Diurnal Performance in Athletes, which concludes that body rhythms can be divided into three general categories known as chronotypes / circadian phenotypes – early, intermediate and late. To highlight how the genetic make-up of an athlete can impact on their optimum time for training, they analyzed the various performances of 20 female hockey players who performed bleep tests at at six different times between 7am and 10pm. The participants filled out a questionnaire to determine if they fell into the category of early, intermediate or late and the results proved to be very interesting. Of course to learn more about our bodies we need to listen to them and that is where the process of monitoring areas such as training, sleep, nutrition is so important. Metrifit offers athlete centric, simple and effective monitoring with clear concise results leading to actionable intelligence.